OOFOS sandals are not the typical flip-flops you would purchase at the mall. Instead, they are one of the most comfortable recovery sandals you’ll ever wear! If you are someone who lives an active life, spends a lot of time on your feet, or has problems with sore feet, you’ll love OOFOS! They are one of the most comfortable recovery sandals, biomechanically engineered to alleviate the foot stress and soreness caused by your daily grind. What makes OOFOS Sandals so great? You may be wondering, what makes these foam sandals so great or what makes them the most comfortable recovery sandals on the market? Keep reading and find out why OOFOS have some of the best customer reviews. 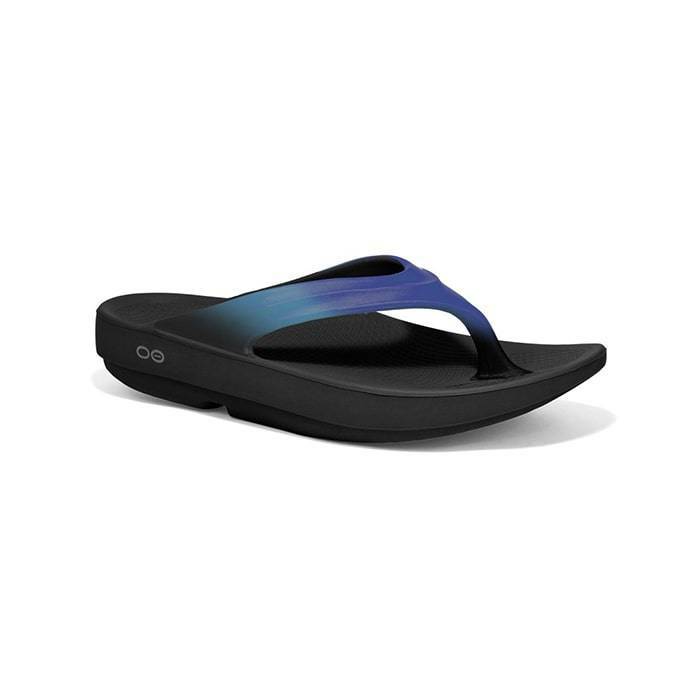 OOFOS unique OOfoam technology offers 37% more impact absorption than traditional EVA foam found in most flip-flops and running shoes. Eva foam is designed for responsiveness, whereas, OOfoam serves as the opposite by absorbing impact. As a result, reducing stress on your joints. In addition, this unique OOfoam provides greater support with enhanced cushioning to increase blood flow and stimulate muscles. Each footbed features exceptional arch support that helps alleviate pressure off your feet, ankles, knees, hips, and lower back. 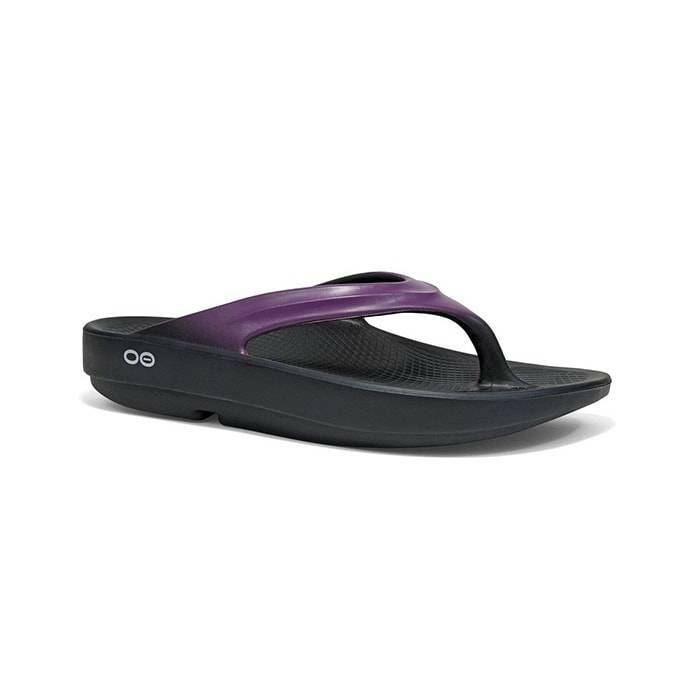 OOFOS sandals offer a serious rocker effect from heel to toe. These sandals promote a gentle rolling motion, allowing your foot to easy back into relaxation after any physical activity. Compared to the traditional EVA foams, they keep their form longer; keeping you from constantly buying a new pair of sandals every couple of months. OOfoam experiences lower abrasion since it moves with the ground and your foot at the same time. It works with hard surfaces rather than against them, which reduces the wear you would see on a normal EVA sandal. 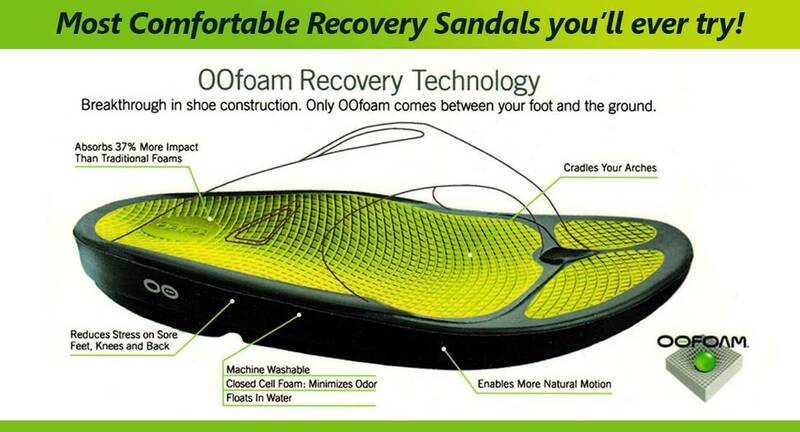 OOFoam prevents bacterial build-up in the footbed. Patented footbed design for optimal arch support. OOFoam absorbs 37% more shock for reduced stress on joints. Footbed flexes with your foot for barefoot comfort. Can OOFOS Sandals really help me with recovery? 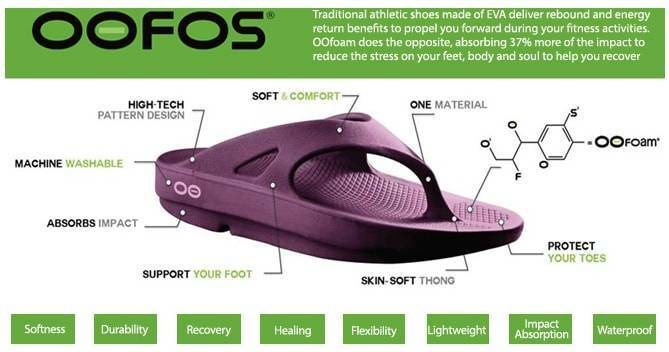 OOFOS was developed for the purpose of helping athletes recover in between workouts. They were created to be your go-to shoe for taking the stress off your feet and joints, so you can rebuild and recover before your next workout or physical activity. Yes, the impact absorption properties of OOFOS really do take pressure off of your joints! They allow you to go about your day after a workout or physical activity without adding unnecessary stress to feet and joints; giving them time to rejuvenate and recharge. Why are OOFOS best over traditional flip flops? Compared to traditional flip-flops, OOFOS offer the cushioning and arch support you need to get you through your day pain-free! If you’ve owned a cheap pair of flip flops or currently own one, you would agree that they lack cushioning and support. Correct? You would also agree that after a couple of hours of wearing traditional EVA foam flip flops, your feet are begging for a break! They are not healthy on your feet, period. Conversely, OOFOS sandals cradle and support your feet; so you can stay on your feet all day long. Finally, most people usually opt to buy them for their cheap price. 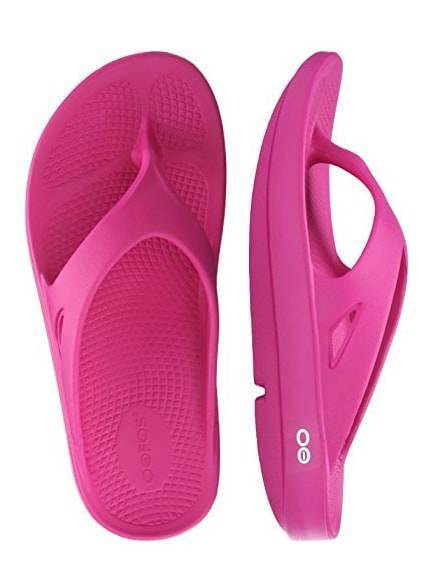 However, if you agree with, “buying cheap could cost you more”, you should strongly consider OOFOS over typical flip flops. How do I determine my OOFOS size? If you normally wear a whole size, we recommend you to order the same whole size of OOFOS. For women who normally wear a half size, order a half size UP for your best fit. For women who normally wear a half size, order a half size DOWN for your best fit. If you are looking for Most Comfortable Recovery Sandals, come into any one of our stores located in Anaheim Hills, Rancho Cucamonga, Riverside, San Dimas, Temecula, Long Beach, Costa Mesa, La Quinta and Palm Desert! 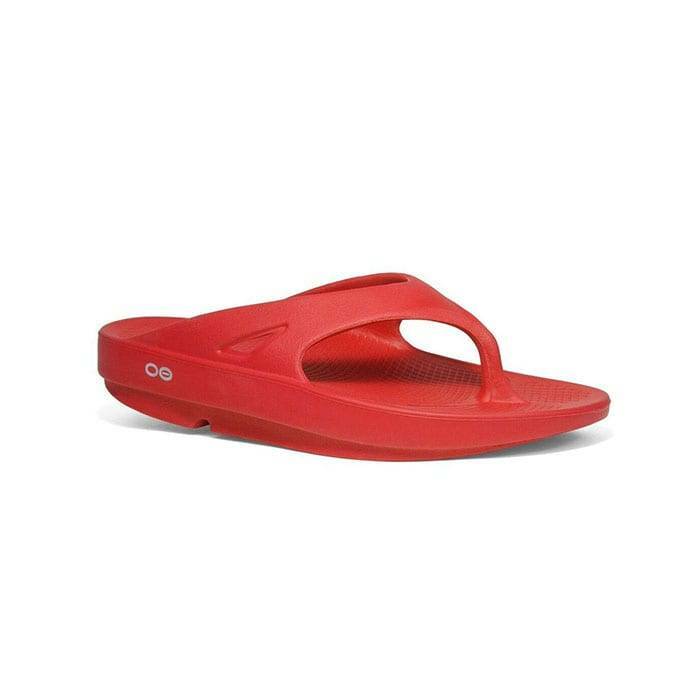 If you are looking for OOFOS sandals in Anaheim, Anaheim Hills, Yorba Linda, Brea, Orange, Placentia, Costa Mesa, Santa Ana, Fullerton, Irvine, Villa Park or Tustin; then visit our store in Anaheim Hills or Costa Mesa. 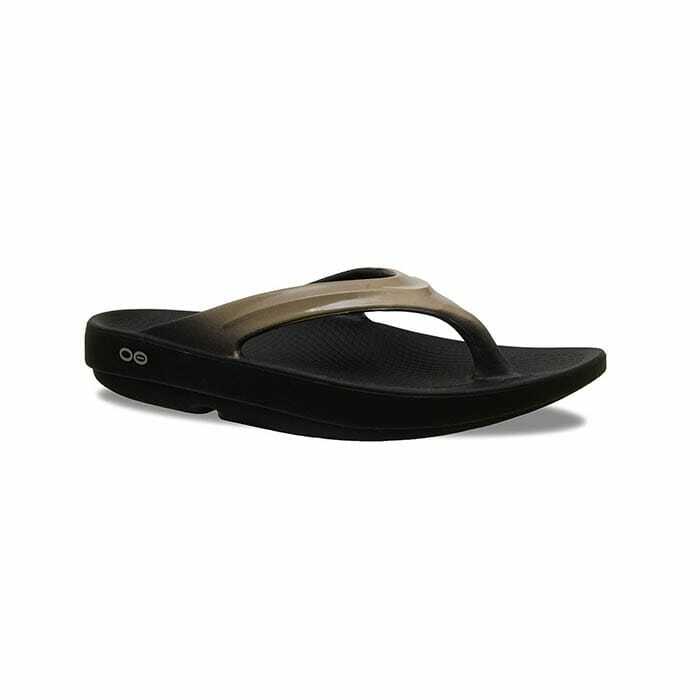 If you are looking for OOFOS sandals in San Dimas, Glendora, Pomona, Covina, West Covina, La Verne, Azusa, Diamond Bar or Claremont; then visit our store in San Dimas or Long Beach. 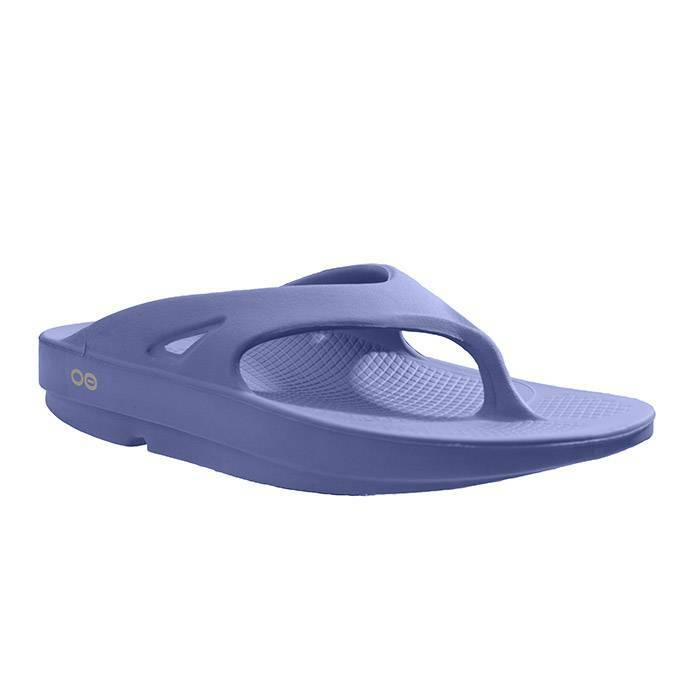 If you are looking for OOFOS sandals in Rancho Cucamonga, Ontario, Upland, Fontana, Rialto, Chino, Chino Hills, Mira Loma, Eastvale, Colton or San Bernardino; then visit our store in Rancho Cucamonga. If you are looking for OOFOS sandals in Riverside, Moreno Valley, Corona, Rubidoux, Loma Linda, Grand Terrace, Redlands or Norco; then visit our store in Riverside. If you are looking for OOFOS sandals in the Temecula Valley, Murrieta, Fallbrook, Lake Elsinore, Wildomar, Hemet, San Jacinto, Pala, Sun City, Menifee, Canyon Lake, Perris, Bonsall or Anza; then visit our store in Temecula. If you are looking for OOFOS sandals in Indio, Coachella, Thermal, Vista Santa Rosa, Valerie; then visit our store in La Quinta. If you are looking for OOFOS sandals in Cathedral City, Thousand Palms, Palm Desert, Palm Springs, Desert Springs, Rancho Mirage or Bermuda Dunes; then visit our store in Palm Desert.